G-System, Multi-Effects for Electric Guitar from TC Electronic in the G-System series. Tonejunkie's review"Awesome unit for the right user"
Great unit here! Lots of effects and options here. Legendary choruses, delays, reverbs, and more. Unit can be interfaced via USB to edit patches on your computer, as well as for firmware updates. The unit has a unique feature that allows it to be used totally as a floor processor, or the brains of the floorboard can be put in a rackcase for more complicated setups, however making stage setup easier at the sametime. I myself use this in a rack with a mesa mark IV head. The unit controls the amp switching for me as well as allows control of stompboxes via its built in effects loop. There are so many features here available its ridiculous. However some people still fail to see its usefullness, and I understand its not the right choice for everyone. For me personally i couldnt imagine any other way. All I need is this unit and an amp head of my choice and i have a world class rig ready to go in a tidy rackcase. When I get to the gig all i do is plug in the head to the speaker cab and run a cat5 cable from the gsystem brain to the floorboard. SETUP DONE! Editing effects is a little complicated at first, but when you understand how the scrolling knobs work editing is a breeze. I find i like to edit by actually scrolling and twisting knobs rather then using the computer editor for some reason. The TC manual is ok, but an even better read is Laird's "White Pages", do a search on the TC forums and they are pretty easy to find. He guides you through the whole setup process very easily and methodically. I primarily use this with my G&L legacy and a PRS CE22 and it sounds stellar with both. When this unit first hit the scene people swore they could hear the "digital converters" and all this other nonsense. I just hear a great product with a great rep buy a great company. Ive been using this live and in the studio for almost 6 years now and have never had a problem. The only thing i feel TC shouldve added in this unit is overdrive/distortion. They even included that on the stripped down Novasystem. Another cool feature would be a looper of some sorts. With those things added i feel this unit could rule the world!!! If it did die...which it wont...i would get another in a heartbeat, would probably look into that newer Red version they are making now too. loudfunk's review"Jack of all trades...."
Multi effects box/floor controller...that lets you use 9 build in effects simultaneously. Has 4 external loops with 9 volt power supply to use your own stomp boxes with it. 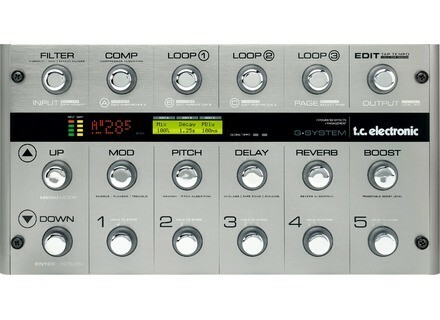 And an insert loop for easy integration with amps with effects loops or pre/power amp set-ups with the 4 cable method. Has no overdrive effects. The only way to get a modulated delay is by using delay into chorus. Routing of effects are good, as in serial, parallel options. It's no Axe-Fx or Eventide H8000 in terms of routing but for it's price point it does a fine job. I used it with 4 cable method and to relay switch between heads and channels of heads. Guitar into the G-system, Insert loop sent to the amp, amp's effects loop back to the G-system, and its putout to the head's effects return jack. This way the compressor, modulation type effects as well as my external stomp boxes in the G-system's loops are in front of the amp, the delay, pitch, and reverb after the amp's pre-amp. Also the G-system gives you a boost which technically isn't a boost. The concept is the overall level gets reduced by whatever decibel amount you chose and when you need a boost you basically stomp on the switch and have unity gain....boosting your signal by what you previously cut it. The effects were fine, I really like the pitch shifter actually preferred it to my Eventide Eclipse. The delays and verbs didn't do it for me. Compressor was nice, filter were also not my thing. I loved the convenience and integration of the G system it is very well thought out, but ultimately I ended up rack mounting its brains and using it as a floor controller. And when I went back to racks I realized that an Eventide Eclipse and external midi controller worked much better for me, and ultimately the Fractal Axe-Fx retired both set-ups for me. I guess my point is...if you set-up is a few stomp boxes and a channel switching amp this is a great way to make for less tap dancing during songs, but when you start extending the amount of gear you carry dedicated units are a better way to approach this. TycoTyco's review (This content has been automatically translated from French)" Works "strong""
Configurable thanks to Vyzor G-System software - Super convenient once assimilated, but it is not rocket science .... Some bugs in XP ...! My sets are ranked in order of the directory, a little way, and presto, it rolls. Really handy on stage ...! In all honesty, I prefer the sound of my "classic" fiddled with his pedalboard pedals (more warm!! ), Now the practical side of G.System is attractive .... And the sounds are still very nice ... must tweak the settings, and then there is time to pass before the desired result! weight bearing: Transportation is heavy on stage it does not move ...! I just attended a concert drums trio / bass / voice whose bassist, playing his old Fender Jazzbass almost like a guitar, playing on stack with head Hartke HA 3500 Hartke cabinets and two cones Alus a 4x10 and 1x15, with a G System upstream to Pramp single / multi-effects. Hartke head and led equalizer showed a correction slightly hollow on the mids, nothing more, everything else just nearly noon. Slightly lower recovery via DI faade, but so face the amp (+/- 3m, tiny room requires), I could apprcier relatively as it should sound of this lment. In terms of saturation, natural compression of the lamps on the attack seems mimics fairly well, with a lot of "soft" clean sounds seemed honntes. the effects utiliss number by bassist in question also seem good quality. One has the impression of having to make a multi srieux effect without hsiter. BUT: what lack of heat ... The saturations, which may possibly be compelling live recording, still shy in harmonics, even when the sound is overall quite cold ... Knowing quite well the heads Hartke HA 3500, I have always found the sound a bit steep, but I think the record would Gnral Either way better if Pramp / multi FX was more "hot" and "living" , heard by the rendering is when even fairly flat. I do not know if this advice will much since there is no question of a test, but a judgment I would like to focus on an amp that I had in the ears for an hour , live. It is often not objective when it comes to acqurir the stuff, I think that such a decline can be interesting. The sound is good for the digital, but still a little too flat and cold. To be honest, I t frustrated by saturations, that reminds me of the less prestigious brands modlisations, that I have always sulking. I would have loved to perform the test with the same stack and even a prampli lamps + G System multi effects. Jedi64's review (This content has been automatically translated from French)" I did not like"
Product extremely complicated, so many parameters, it is both well to cover all possibilities but tedious to master the craft. The manual is comprehensive but does not give much advice to use! 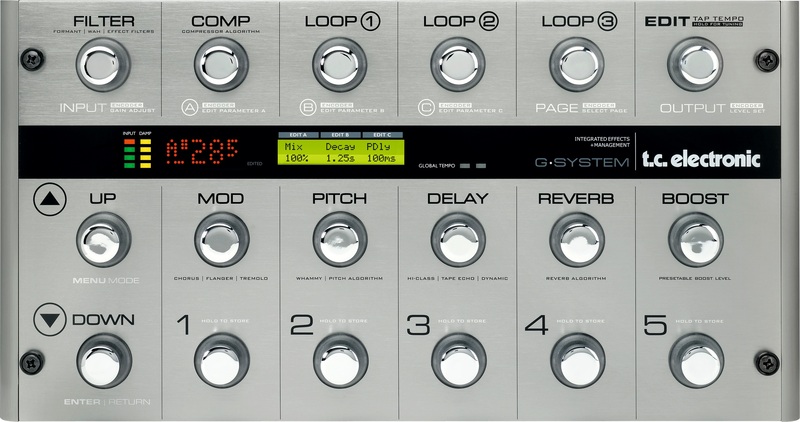 While effective, the effects and management of other pedals, loop, setting levels, the parameters of each effect are legion. All effects (almost) are arranged, even rare events, like the formants. Dual processor patch changes so gentle, very pleasant, very professional. In addition, the tap-tempo does not take into account the two last shots, as is often the custom, but the last 10 taps (or 8, 5 ,...) This results in a terrible efficiency find the tempo, because it is the average of your shots. When you change tempo, all effects that are not on a "ignore" the tap tempo snap to the new tempo, each effect according to the rhythmic value that you assigned. As a result, the expression pedal (optional) becomes superfluous. Otherwise, this pedal is very sturdy, I have shot with and he never let go. But it's not that complicated, it is sometimes well thought out for players who have not done extensive studies of sound engineer. Ex: some effects such as compressors, chorus and others are arranged version is semi-pre-set or in "advanced", that is to say with a variety of settings. The overall sound is slightly altered, a bit "cloudy" without being disagreeable, and there is a small loss of momentum which is unfortunate given the price of the machine! Put 1 or 2 / 10 as noted in sound quality this unit is intellectual dishonesty! As for the argument "for the price, no mercy," I note that the ratio Q / Price is noted in the overall opinion. Sound quality in the section, there ... sound quality, yes! Mud and flute, what! Dare I add, damn it! In summary, the effects are varied and of a quality that ranges from high-end and some of them mean to others. Used for 2 years and a half and over a hundred concerts and reweighed, I find that this multi-effect has an interesting connection between sound quality / size / functionality (turn "organizer rig" that I did not insist ) but I finally tired of his sound reproduction "can do better" and edit a lot of presets for each song, and went back to my tap dancing on-board analog pedal. Quality / price ratio, given the poor sound quality of certain effects. With experience, I will stick to my first impression of the day when I had tried in the store, found him "cold" and was left without buying it (I had finally bought later, after a concert where I had had enough of playing Fred Astaire). Nonetheless, it made me proud to service many small and large stages. So bye bye Mr G, and no hard feelings! Yes recently thanks to the interface pc / mac or so prvoyez of knee pads. The edition is not as simple as GT8, pod xt live or tonlabs vox that I've experienced. English manual in tlchargeable franais on the site. Then the c ... crap !!!! Apart from the delay (and still it is better on the tc nova delay) and reverb, you have to spend time. Shabby and cold Chorus, impossible to heat. Phaser, flanger, tremolo, compressor, gate, rsonnance, formants, etc ... everything is gadgets. Wha-wha whammy, adpanne but has nothing to do with good pedal wha wha or whammy4. Harmonizer not bad at all. Used with a head marshall jcm 2000 Mesa Dual Rectifier, Laney VH100R on 4x12 vintage 30. The conversion is zero (technical 4 cables) nothing is understood ALTR sound (breath, loss of power, a big sail on the sound). For lovers of lamp amp is better forgotten. I got used 1 year and 2 times. Everything except the delay, the harmonizer, the robust cot of the machine, 4 pedal power supply, and loops. Better to lose the practical side and replace them with good pedals. Yes the list is too long. frankly 400 euros are sufficient. - What are the effects or types of effects available? - 4 insert loops for external pedals. - What technology is used? - Are they edited? Via an editor Mac / PC? - Output S / PDIF. - An expression pedal input. - A volume pedal input. - 9V power supply 4 (4x50 mA) to power the pedals. - 2 CHANNELS relay to drive the amp. - 1 USB port for updates. -5 Buckles: 4 (pre-preamp and standard) to accommodate pedals and a loop to insert a pre-amp (rack, combo or head). - Is this a rack or rack-mount model? Yes and no, really well done for elsewhere (see instructions). - The general configuration is it simple? Yes to that already fiddling with multi effects, it is not rocket science, just be careful with different level settings (guitar / O loops, input / output preamp / power amp input). - Publishing of sound effects or is it easy? Here too, for those who used the effects and their parameters, nothing complicated, for cons I can imagine that for the "newcomers" from a set of pedals, is enough to tear hair with the menus and sub menus, obviously for them it is not plug&#39;n&#39;play. Yes, everything is explained, initially it should even be your favorite book, story of what led to the ergonomics of the machine. Well, it must be admitted that the concept is great, the effects available for guitar are present except disto.Et so much the better for me that does only that the OD of my amps and some good analog pedals dedicated to overdrive / distortion that make it anyway better than any computer simulation in fashion. The G-System is a true multi-effects, simulation without invading the most current multi effects, and that, it was missing. One can easily change the channel on his amp while activating a chorus pedal housed in a loop and activate the delay of the G-System, and the pressure of one foot. And finished ground loops, breath, hum, ground loops, the transformers and jacks lurking. So a big thumbs up for this concept "while a" unique (for now). Also, I found this great little rig next organizer. The following remarks are completely personal and subjective, of course. - Effects are they effective, responsive and realistic enough? Yes, the effects are effective, we can not say otherwise, but overall I&#39;m disappointed, it did not change one iota from a G-Force yet 10 years old. 10 years apart and no bonus multi sound is noticeable despite technological change. The intrinsic quality advanced effects do not at all that time, probably using TC and again the same algorithms "age" or the conccurents to making progress. It&#39;s simple in the long run, I no longer use the compressor or the modulations and even less wha wha G-System. The compressor of the G-System has been replaced by Keeley (more efficient), the chorus (depending on the desires) by Boss CE-2/DC-3 or an old TC SCF. I replaced the phases of the G-system with a MXR Phase 90 or Boss PH-1. As for the wha, a Fulltone Clyde has replaced that of the G-System. I insert these pedals (except wha) provided for in the loop, because the modulations of the G-System does not make the weight for those old pedals in his "change over time" warm and alive. What is the difference between a grain of G_System phaser and an old PH-1 !!... I always come back no, ca may well be a Boss, what is more ... old, yet it sounds really better. The flanger also are not very beautiful, cold, without grain, without independent, neutral. Over time I used only the reverb and delay of the G-System. The delay is impeccable them, no complaints, really good, the reverb is not bad but that of my old Lexicon (MPX-1) was more beautiful, rounder, softer and more natural, less "sharp", less "incisive ". The chorus is okay once properly adjusted but not exeptional, the also have tested extensively the effect of a multi party Boss GT-8, except for delays and reverbs that sound better in TC, it comes with wicked G System-to three times cheaper and I would venture to say that the modulations of the Boss GT-8 are better quality than the G-System is on in any case for phaser and flanger although for Boss chorus grain is here (we like it or not) at least the chorus Boss has a personality, a "signature" sound that the TC (grain-free in fact) does not have. So big disappointment for me in terms of noise, and parameter settings can improve the situation but do not provide a miracle solution to the grain base, or rather the lack of grain should I say. The overall imaging is often cold and very "clinical", with surgical precision, it seems that the effects are not "soul." Just over two years now. - What is so special that you like best? What is so special that you like the least? -Blocks effect pre digital preamp. -Poor overall quality of most of the effects (compared to the original price of the machine). Phaser and flanger them awful. I owned a Intellifex, a G-Force, an MPX-1, the familiar GT-8/Pro and has some good pedals. Okay on occasion but somewhat exaggerated neuf.Si On the basis of that point of view of quality effects, it is three times too expensive. The look, robustness and overall concept are very professional but the intrinsic quality of the effects is unworthy of the price of the machine. If only the quality of the effects were at the height of the rest, the pedal would have been the ultimate pedal. The concept of the G-System has been the priority of TC which is not a bad thing either in the short term, but hoping that their next priority for any future pedal, essentially focused on the quality of the effects, algorithms in order to renew their "age" that over time, are no longer up to be labeled "high end". - With experience, you do again this choice? Yes, when the concept, not when the overall quality effects. Reviews on this crankset are too divergent, indeed it is either 10 or 0. The purpose of Reviews Audiofanzine is to get an idea on the quality of matrielle. Diffrent opinion concerns my taste prejudice the integrity of this product, both for those who make the apology or lynching. It's against-productive to potential buyers, seller, and even screw screw brand that produces it. So I will wish that these DIFFERENT member Audiofanzine more explicit, more arguing on critical or lodges. This product is difficult to test in store for many of its possibilities. I myself am even Intress by it's my doubt is deep on the qualities of this crankset Introduced. I call the whole community Audiofanzine common sense and be part of a better use of "democracy" that gives them the right to speak on this matrielle. That is to say my great interest in this site and for the interest of all that I invite members better direct their arguments and their description and example through the use of sound example of their production or another in order to illustrate their opinion and give them tural value. Dj because it is an expensive product, it is true, so we do not buys on impulse head and, moreover, it is difficult to test in any prior notice or m me so given its capabilities. Biensur, This should apply all reviews audiofanzine. But Adi product Adi would be a big step. Voila, thank you. My name is in the good sense of team of moderation to not delete my topic because he listed his thinking in a fundamental duty of a member of the site, that of being protected in integrit of this website. SIGNED, a student of The Term will soon pass his exam! All the effects of other traditional lplus used "nothing". - Are they ditables? Via an editor Mac / PC? - What is the connection? Complte trs connectors, see the user manual on the site TC. - Is this a rack or rack MODEL? This offers some pdalier Detachable rack is. - The configuration gnrale Is it easy? Yes, not rocket science to be that one gets used this type of machine. - Effects are they effective, suitable and adequate ralistes? Otherwise, overall, is far from the top. Manufacturers of effects pedals have no problem being, this is not the G-System that will worry them and he would even significantly. - Which instruments do you use? - What are those you prfrez, you dtest? My prfrs effects:, Delay (flawless) and Rverbes (a little too cold my taste, even though RULES). Chorus without proper but nothing special, especially considering the price of the machine. I hate effects: Compressor (pourave), Phaser and Flanger (die laughing, or crying, it depends ...), Wha (just for fun). I do not m'tallerais all other effects + / - useless gadget, such Whammy, Intelligent Pitch and others. I used it for over a year and recently he t trs advantageously replaced by a Lexicon MPX-G2 + MPX-R1 pdalier which sastifait me more in every way. Keep your pedals good and complements a rack Delay / Rverbes digital. Its cost you three times cheaper and AC sound at least as well. It is "style" to say, I possde a g-system, it is indeed beautiful trs, trs flexible, robust and trs "trs pensquot well, but did" nothing "under the hood. In short, I TC AIM that lingers a bit more about the quality intrinsque effects. Overall it sounds (as mentioned below) trs cold, rigid and clinical aseptic brief. The modulations of the TC are just "clones" of digital modulations REAL analog, which they sound REALLY good. By INSR against a head full high-end tube is a different story. (Thank you to double conversions). Especially in the pr pramp really unnecessary especially in view of rsultat mdiocre obtained with compressors and filters, an analog solution would prfrable t in terms of efficiency and noise would Satane convert and saw this as dja said, always doubling the signal and converts even in bypass, gnial right? A true bypass would t the very least to avoid this unfortunate gap. Trs good ide to insert the four pedals, but calls up pramp pr. Just as the internal routing of effects is limited to a multi trs such a price. Impossible to effect this or that particular place in the chaining. In short, pdalier indispensable to "the beautiful" in front of friends. Pdalier avoid if we want big sound level effects. Way overpriced for a comprehensive quality effects without personality and sound quality rather average or even "mdiocre" (Phaser, Flanger, Compressor, Wha, as already mentioned below). I regret that the G-System sounds exactly like a G-Major for more than three times the price of the latter. The setting or reused such a sum for a multi-FX, silent expect a good quality sound effects suprieure to that of the G-Major, hlas this is not the case here.